Podcast Episode 50: James Cary, the sitcom geek! James Cary was the creator of the radio sitcoms "Think the Unthinkable" and "Hut 33" and was lead writer on the sketch show, "Concrete Cow". For TV, he has written for "My Hero", "My Family" and "Miranda". More recently he co-wrote the BBC Three series "Bluestone 42" with Richard Hurst. We talk to him about comedy, about writing material for others and about getting your own show off the ground. And also about the differences between radio and television. And also, a special thanks from me to those people who emailed in after the previous episode with ideas and general positive vibes. We appreciate it and will be using your ideas over the coming episodes. Our recent feature film - Who Killed Nelson Nutmeg? AT LAST! Its the book of the podcast - with even more great advice! Myself and Danny finally sorted it out, and its now live on Amazon for sale in time for Christmas, like the couple of mercenaries that we are! See below for our pitch video and the blurb. Want to get out there and start earning a living as a writer? Sure, we all have dreams of selling a script for big bucks. But what can we do while we wait for that to happen? How do we give up the day job and be a working writer? That's what this book covers. How to successfully pitch... yourself! A shorter episode this time. We reflect on the best lessons we have learnt from the London Screenwriters Festival and urge you to come along. We'll be giving a talk once more this year. We also ask what you want us to cover? Let us know via ukscriptwriters@hotmail.com or via twitter or Facebook. And then we plug three things. 1 - Who Killed Nelson Nutmeg, our debut feature film which premieres at the London Film Festival on the 10th October. 2 - A spin off book for younger readers called "Who Needs Friends Nelson Nutmeg?" which is on Amazon now. 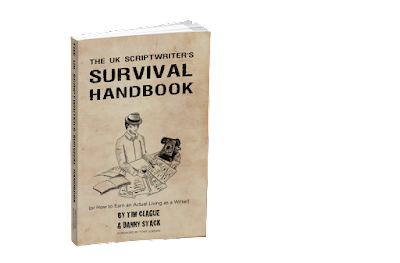 3 - A brand new book from us, full of our best tips ever called "The UK Scriptwriters Survival Handbook" - get it now on Amazon too.